One of the common patterns with web services is the router service. It can hide routing logic from the client or help with load balancing. 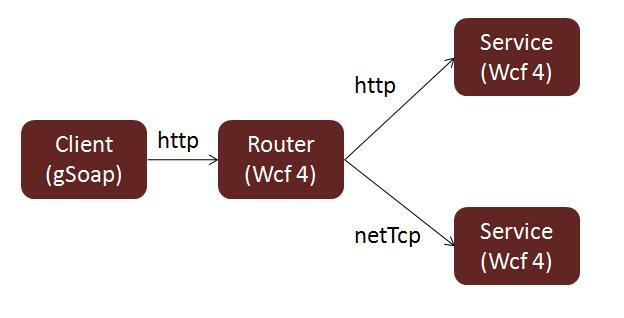 Wcf 4 ships with libraries and samples to help build such a router very quickly. Stephen Liedig had notified me recently on a problem which happens when a gSoap client calls a Wcf router. gSoap is a very popular CPP web services stack. We need to ask two questions: Why this error happens? Why not with Http? Something is missing – the “p” prefix declaration (xmlns:p=http://myNs/) which was present in the message form the client to the router does not appear. This makes this message invalid as it references the undeclared prefix "p" in the "p:User" derived type attribute. But why did the router sent an invalid message when the client sent it a good one? And why not with Http? If the input message (from client) and output message (to server) have the same version, and no security is involved, then take the input as is and send it. This explains why the Http case works. Otherwise take the input message body and copy it to a new message. Then copy custom user headers. Since the “p” prefix is not defined under the body but under the root “envelope” element, this prefix is not sent which makes the message invalid. This explains the netTcp bug. Why Wcf behaves in this way? Dismissing this behavior as a bug will miss an important discussion. Consider the naïve fix: Parse each attribute under the body and search for the something:something pattern. Since the router has no information about the message semantics it has no way to know if the pattern relates to a prefix or is just a string which looks like this. Moreover doing this would be a huge performance hit, especially with big messages. What should be the correct behavior? Copy all namespace declarations from the root Envelope and Body elements of the original message into the corresponding elements of the new one (including the default namespace). Make sure not to overload the previous prefixes with new definitions in both elements. Yes, I can think of a few edge cases where this scheme fails. But a more comprehensive solution would cost in performance. As it stands now, the default gSoap client fails to call the default Wcf router when protocol bridging is used, which is a real interoperability problem. And Just to clarify, this web service does not define any derived (=inherited = known) types. For some reason the gSoap default message generation logic uses the xsi:type even on base types. This is not forbidden since it uses the correct type name, although there is no real reason to do it. Anyway this makes this case quite common and not limited to services with derived types. And, yes, this is one of the reasons not everyone likes Xml.